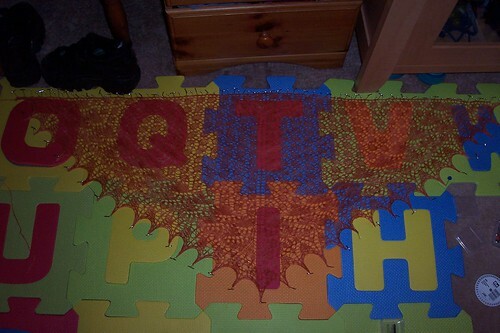 Swallowtail blocking, originally uploaded by lyndsey-jane. I got around to blocking the Swallowtail Shawl tonight. I managed to get hold of some foam maps to use as blocking boards and boy! does it make life easier. I am really pleased with this shawl and can’t wait to wear it next week when Mum and I go to Dancing on Ice tour. I am now officially a BSc Microbiology student – no more Biomed!!! We received copies of the new Biomedical Science pathway last week and I discovered that I the option to specialize had been removed and we now had two generic modules covering all 4 areas, rather than one modules covering all four and one specializing in a chosen area (microbiology, haematology, clinical chemistry or cellular pathology). I really think I have made the right choice doing this as I wasn’t 100% happy with the modules I was due to do on Biomed and am excited about all the microbiology modules. After finally ploughing through all the paperwork I logged on and read some blogs at uni, and this is the first thing I saw on the Lime n Violet Daily Chum. Can we say spooky! I so have to make some of those. I have my first parasitology lecture tomorrow and will know absolutely no-one as this is one of the second year modules I have had to pick up. This week we are visiting the Museum of Zoology which should be interesting. In knitting news, I have cast on for Karl’s Cobblestone sweater and it is looking good.I am using Cascade 220 heathers in a greeny brown. I’m loving the way its knitting up and thankfully so is he. My gauge is slightly off but as he is between sizes I am knitting the size up which will come out slightly smaller then the stated measurements. I had a bad case of startitis last night and cast on for Wisp with my olive green malabrigo lace. OH. MY. GOD. this stuff is amazingly soft. I so have to get me a sweaters worth of the worsted weight, ideally in the olive green to make the Tree Jacket with. I have come to a major hurdle with the Deep V Argyle vest, all the knitting and steeking etc is done but I am at a loss as to how to sew the ribbed neckband up, as I have live stitched at the base of the neck. I love this top so much that I don’t want to ‘make do’ and ruin it. If all else fails I may take it to ally pally and seek expert advice somewhere. I tried on my Wicked! this morning and have faced up to the fact that it no longer fits me, I am 3 stone lighter than I was when I made it and it just looks wrong. I really like this pattern and plan to completely frog it, wash the yarn and re-knit it in a smaller size. In fact i had quite a few problems this morning as it was the first morning this autumn that I felt the need to be warm and nothing fit me. I know I should be glad about this and I am but I really don’t have the money to go buy new clothes – maybe I just need to knit faster!